This page is in Progress, it may contain errors and/or be incomplete. The above is the most basic lay out of the flow mechanism. This is the default state of the flow editor. Name: The name of the flow. Publisher: Publishers name for the thing. Cost: The cost in charges or units for the thing. Level: The level number for the thing. Action Word: Used for description in the Game Log. Type: Defines the things type (Feature or Spell). Trigger: Defines how the triggering mechanic. Roll each time: If the effect has a mulitplier, roll dice each time the effect is multiplied. Positive: Forces effect to be positive rather than negative number effect. I.E. Heal points rather than do harm. Apply Immediately: Fires immediately within the turn. Apply on saved: Apply effect when target saves. 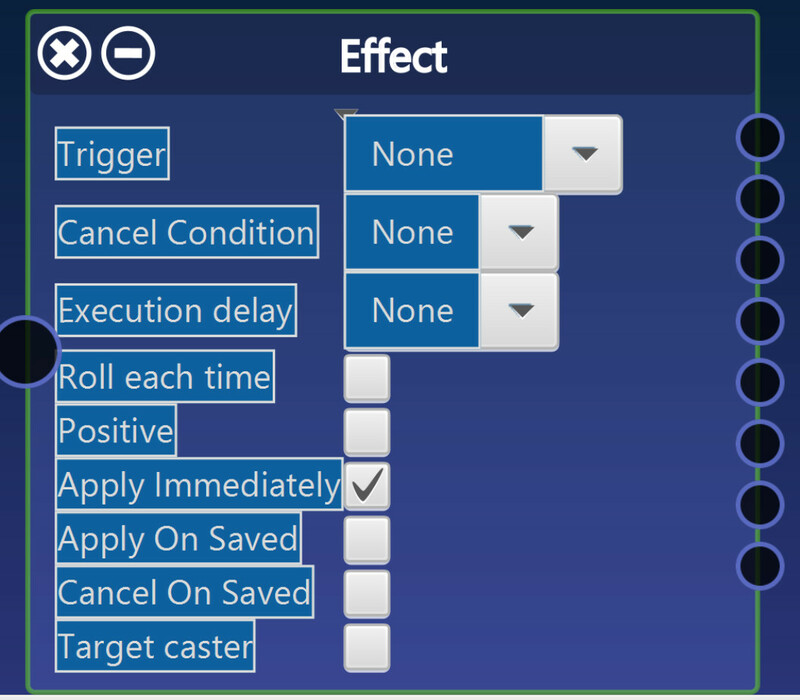 Cancel on saved: Cancel effect when target saves. Target caster: Target the caster by default. Conditionals None: On Target: Fire on the targets turn. On Caster: Fire on the casters turn. On Stay: Fire if target remains in effected area. On Exit: Fire on exit of effected area. On Enter: Fire on entering effected area. * On Cancel: Fire on cancel/end to effected area. 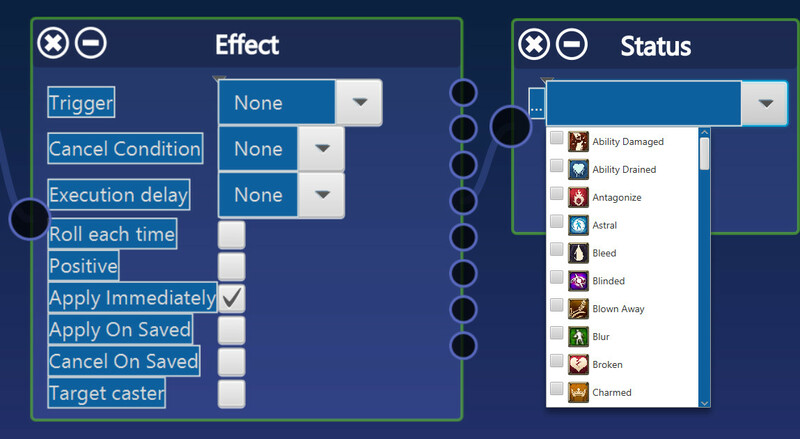 Mod Group: Effect applies to stat or character mechanic. HP: Hit Points of character. Inert: is inert and has no effect. Saving Throw: A saving throw of the character. Skill Misc: A misc skill bonus. Skill Rank: A skills Rank score. Speed: The characters speed number. Sub List Sublist of applicable forms. Mod Type: Various damage types dependant on game system. Input Field: for basic scripting input. Please see Game Management->Rules Library: Flow Input Field for details on this. Primary: Primary save type of target is used. Secondary: Secondary save type of the target is used. Apply Type: The mechanism of the form of multiplier. Classes: Applicable classes to apply Multiplier/Repeat. Use Feature Level: Uses the Feature Level instead of the creature/caster level. Value Per Level: Multiplier or Repeat value. Appy At Level: Levels with which to apply Multiplier/Repeat. Select List: Selects Status marker to apply to the tonekn/creature. 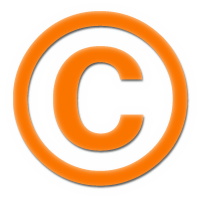 For details on Status markers, please see Custom Data: Status.zip. 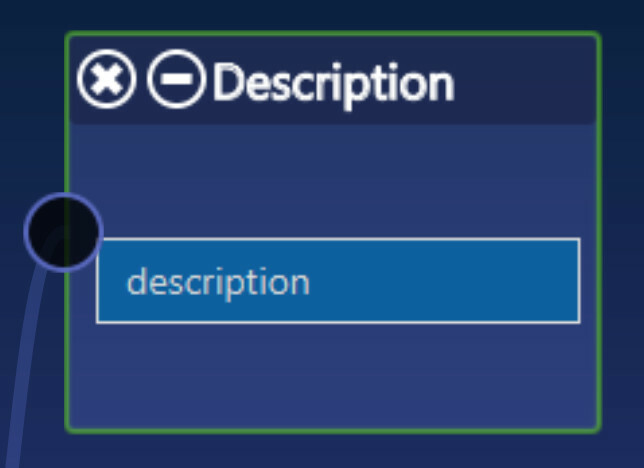 Opens Script Editor to write and define a specific script. 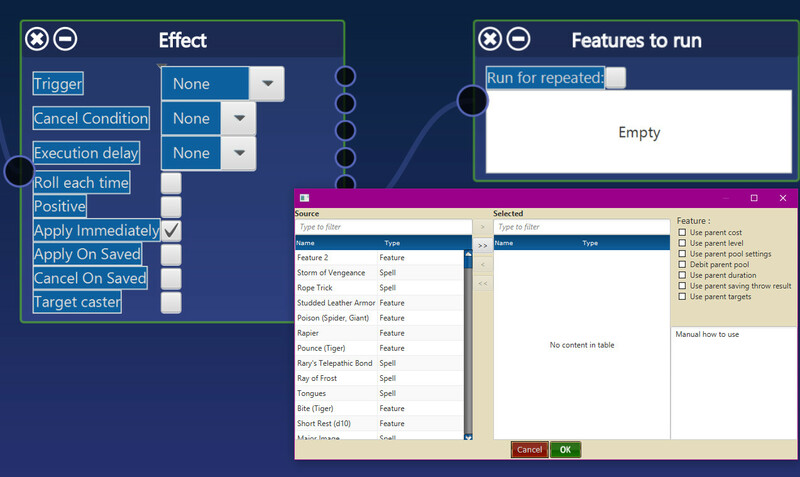 Flow Editor->Effect: Features To Run. Dialog: Opens the Feature selection dialog. 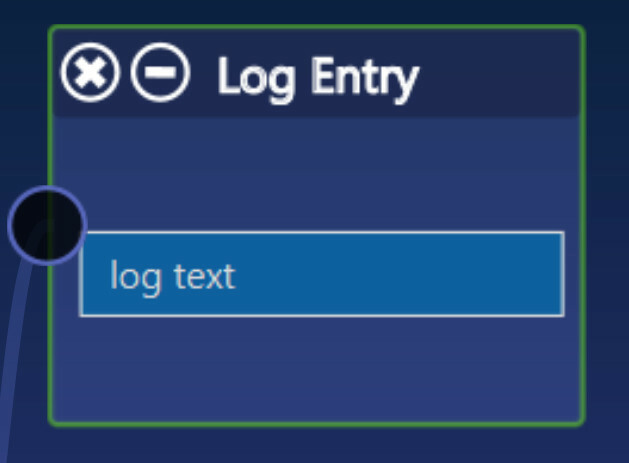 Field Entry: text entry field for Game Log output. Field Entry: Description of Effect. Flow Editor -> Map Template. Type: Various template types (Burst, Cone, Line). Size: Size X (length) selection in feet or meters. Size: Size Y (width) selection in feet or meters. Visible Toggle: Toggles Visible/Invisible to players. 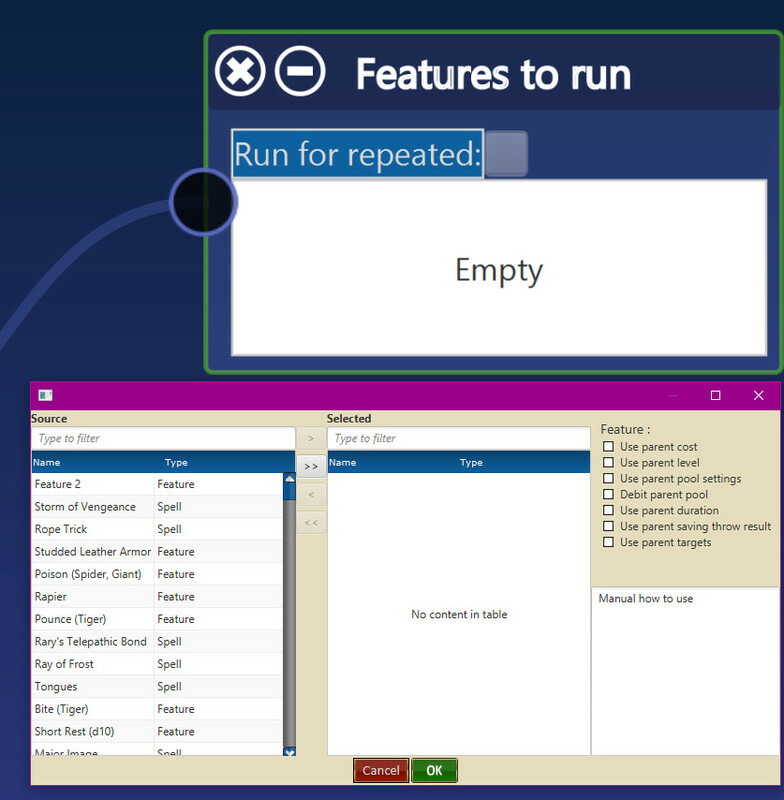 Duration Toggle: Duration definition persistence. Count: Number of templates to place. Custom Color: Please see Color Picker for details on this. Rounds: Happens for a number of rounds based on Combat Mode and Roster. Please see Combat Mode for details on this. Minutes: Happens for a number of Minutes based on the Game Clock. Please see Game Time for details on this. Hours: Happens for a number of Hours based on the Game Clock. Please see Game Time for details on this. Days: Happens for a number of Days based on the Game Clock. Please see Game Time for details on this. 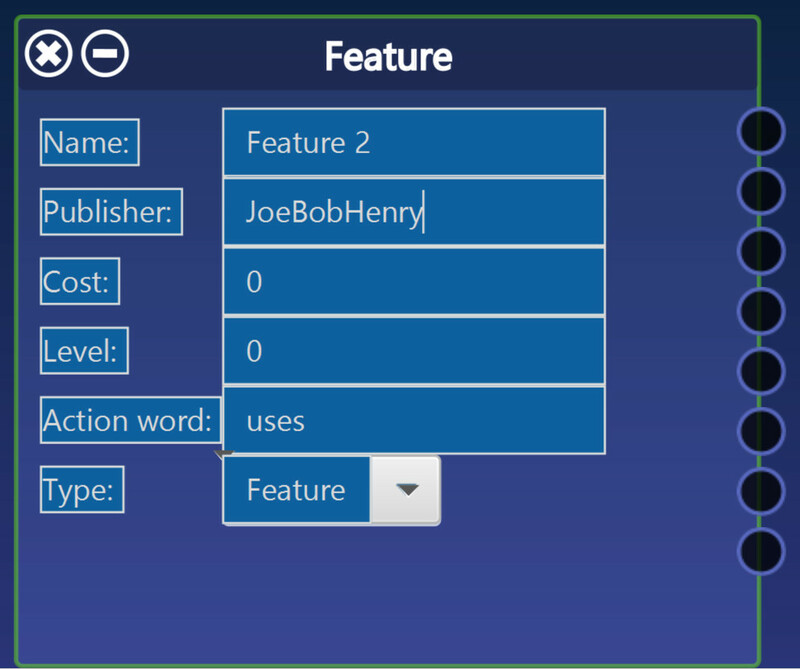 Imput Field: Please see Game Management->Rules Library: Flow Input Field for details on this. Throw: Target number for save success. Negates: A successful save negates effects. Half: A successful save reduces effect by half. 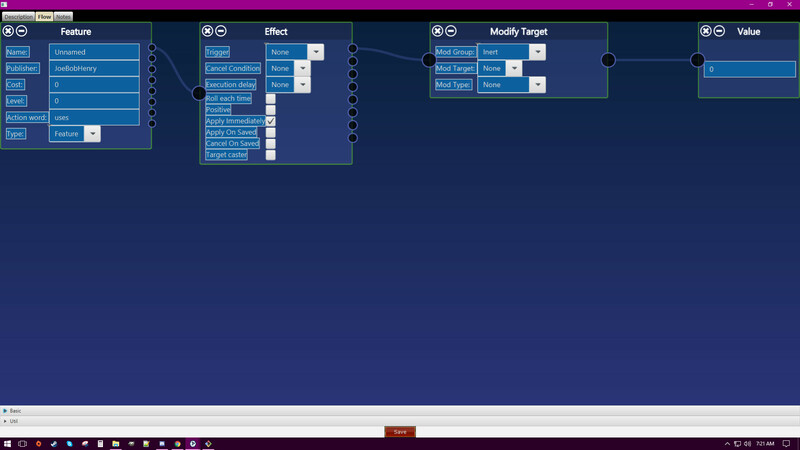 Flow Editor -> Creature Attack. To Hit: To Hit modifier for the Attack. Name: Name of the Attack. Vs: What the attack targets. 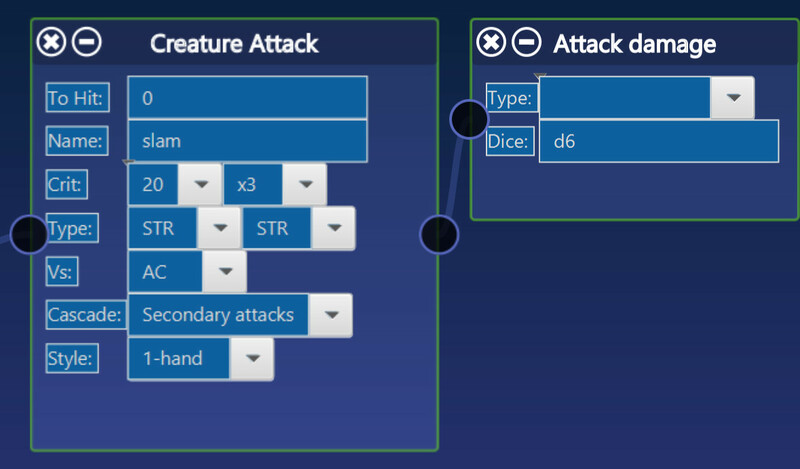 Secondary Attacks: whether multiple attacks are allowed. 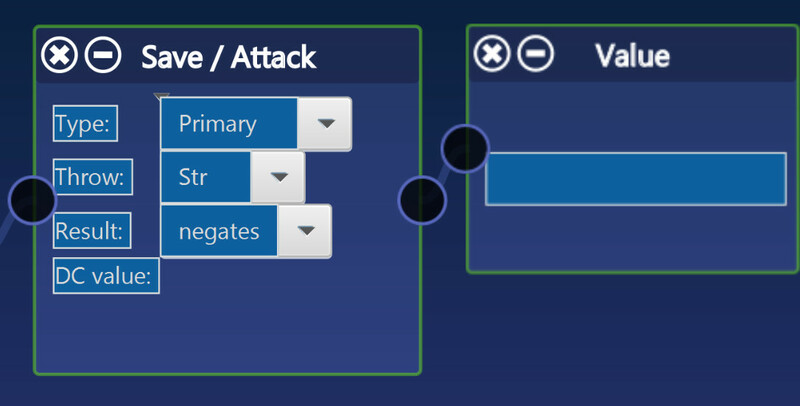 Single Attack: Single attack, no multiple attacks allowed. Style: The form of the attack. Type: The type of damage to be applied. Dice: The value of the damage to be applied. 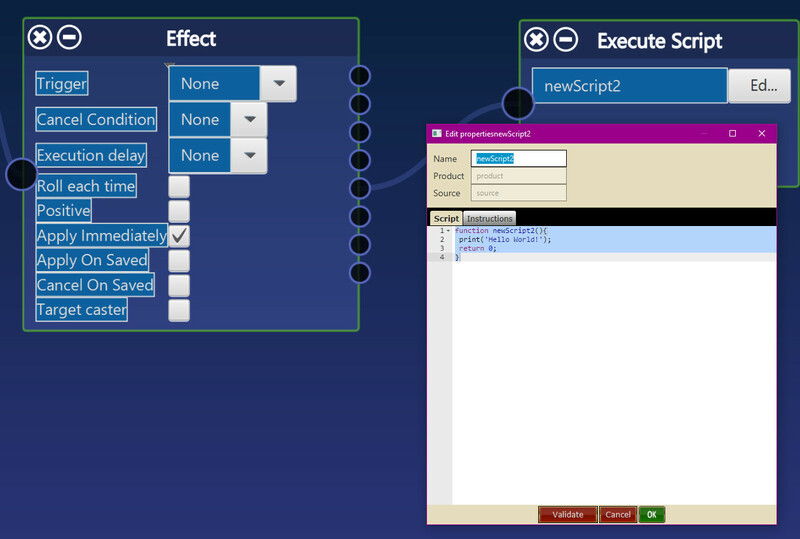 Flow Editor -> Features To Run. Run for repeated: if the effect is multiplied/repeated run these Features for each instance of the multiplied/Repeated effect. 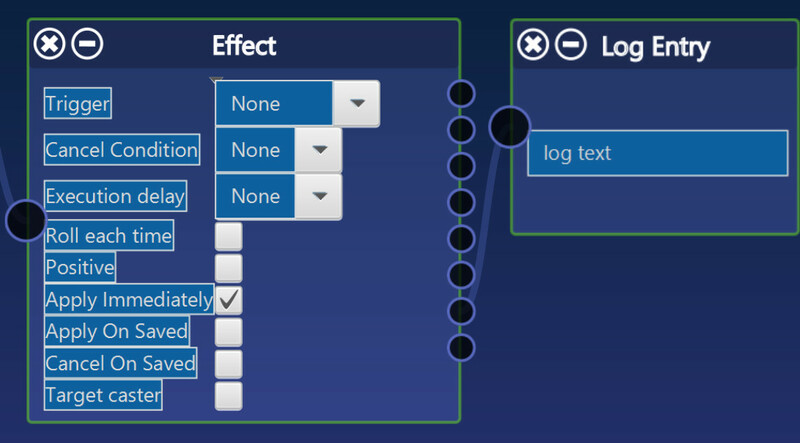 Flow Editor -> Log Entry. 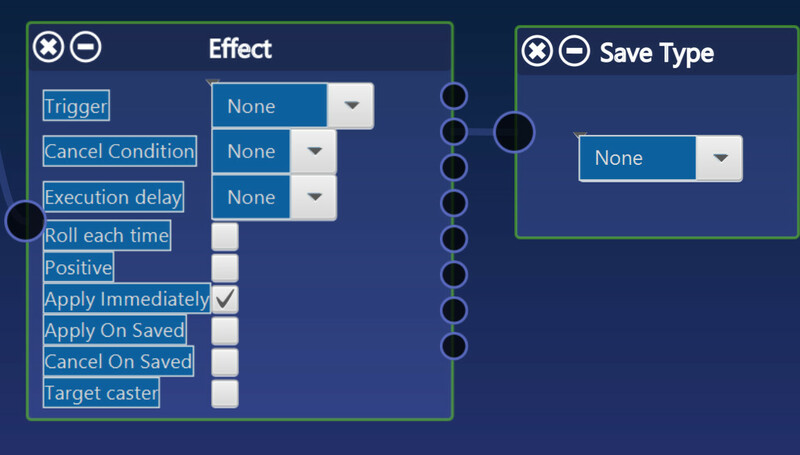 Input Field: Please see Game Management->Rules Library: Flow Input Field for details on this.